BSC Range Management 3rd year students taking course on Range plants and their values from department Land Resources and Agricultural Technology (LARMAT) were led by their lecturer Dr. Oliver Wasonga acompanied by Ms Carolyne Kyalo and Mr John Musembi to three main ecosystems of range lands of south eastern Kenya. The first aim of the academic trip was to study various grasses species and herbaceous plants which are poisonous, medicinal and browsable that grows in the three subsets Athi Kipiti-Kiboko-Kibwezi subsects. The second aim of the trip was to collect, describe and mount the plant species as part of the herbarium practice techniques. This was in fulfillment of practical number 9 in their course outline. Among tree families studied were meliacea, leguminosae, zygophyllaceae, cappraraceae, combretaceae, euphorbiaceae and malvaceae. Most of leguminose species from sub-family mimosoideae and caesalpinioideae. Athi-Kapiti estate, KARLO Kiboko and University of Nairobi, Kibwezi dryland farm. The Department of Agricultural Economics is looking for a part-time lecturer to assist in teaching Agricultural Extension, Sociology and Development, Community Development, and Social Change and Development at Bachelors level during the academic year 2016/2017, from September 2016 to August 2017. Applicants must have at least a Masters degree in Agricultural Extension, Rural Sociology or related field from a recognized university. Those with experience of teaching at the university level will have an added advantage. Mr. Maunguja Bakari Ahmed defended his MSC thesis in Range Management on 15th August 2016. The research topic was on ‘Assesment of plant diversity and ultilization of wild medicinal species by households proximate to Arabuko Sokoke forest in Kilifi County of Kenya’. We wish him grand success and bright future in all his endeavors. 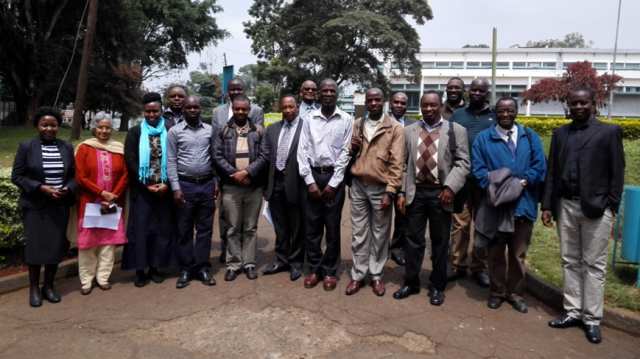 The 8th PhD seminar was held on 22nd July 2016 at the Faculty of agriculture, University of Nairobi. The seminar kicked off at 9.00 AM and it brought together majority of postgraduate students from various departments in the faculty. Prof. Kimenju, the Dean Faculty of Agriculture chaired the meeting in conjunction with Prof Jasper Imungi.